At 8:00 a.m. on Sunday, June 5th, 1921, the first service of our parish was held. The Reverend Charles Hedley was the celebrant at a service of Holy Communion. The following people attended: Reina Hall, Alice Lovegrove, Eva McMicking, Mrs. G. T. Warden, J. Weir Anderson, Nell Anderson, Helen S. Grant MacDonald, G. H. McElheran, Mrs. G. Lanning, and C. Grant King. Thus in the humble setting of an old army tent pitched on top of the hill, a small band of worshippers began the corporate life of our parish church. This beginning was the result of a decade of planning and work. In December 1911, the Toronto Synod through the Toronto Rectory Endowment Committee, sold Glebe land in the Davisville are east of Yonge Street to Mr. A. G. C. Dinnick with the stipulation that two acres be reserved for two church sites. In March 1912, this agreement was changed. The whole area was conveyed to Mr. Dinnick without reservation. With the approval of the Bishop and Rev. F. W. Paterson, rector of Christ Church, Deer Park, in whose parish the land was situated, Synod passed a resolution that instead of two church sites, each of one acre, one site of three and one half acres be reserved. In October 1912, Mr. Dinnick conveyed back to Synod three and one half acres on the south side of Manor Rd. This land was Block “A” Registered Plan No. 1789, Lots 70 and 71 – the site of our parish. It was contemplated that a mission church would be erected on this site in connection with the parish of Christ Church, Deer Park. There was no further action to establish a mission until 1917. Meanwhile taxes were paid each year, not without protest, by the Toronto Rectory Endowment Committee. In June 1917 a motion was introduced at Synod recommending the Manor Rd. property be sold because of the burden of taxes. This motion was withdrawn on an understanding given by the Rev. A. H. Brooke, rector of Christ Church, Deer Park, that he would bring the matter of utilization of this church site to the Vestry of Christ Church, and endeavour to have a definite arrangement for a mission within a year. Later in June of the same year, the Toronto Rectory Endowment Committee approved the Bishop be interviewed about forming a separate parish to include the Glebe Manor church site. An interesting sidelight is the fact that in July of 1917, the Dominion Government occupied our site for a wireless station. In September 1917, Rev. H. A. Brooke wrote to Bishop Sweeny setting out the conditions under which Christ Church would undertake a mission on the Manor Rd. site. In October the Mission Board approved a grant of four hundred dollars to the Glebe Manor mission of Christ Church. On the 1st of April 1918, the Vestry of Christ Church passed another resolution concerning the Glebe Manor mission. This required the sale of one half of the three and one-half acres of the site in order to finance a new building on the remaining half of the site. There is no record of acknowledgement or acceptance of this scheme by any Synod Committee or individual. 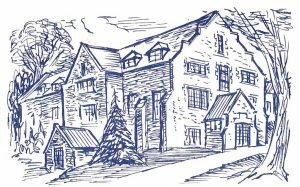 Two months later on June 5th, the Toronto Rectory Endowment Committee reported to Synod that up to the present time no definite arrangement had been made with Christ Church for starting a mission on the Manor Rd. site. This was notwithstanding the resolution passed at Synod a year earlier. Then in April and May of 1921, at the suggestion of Bishop Sweeny, then Bishop of Toronto, Canon Hedley made a house-to-house visit of the area from Davisville Avenue in the south to Eglinton Avenue in the north. Canon Hedley had been transferred from the Diocese of Algoma. When he undertook the visit of the neighbourhood of the Glebe Manor Mission Site as it was called, he was a Chaplain with the Department of Soldiers’ Civil Re-Establishment. Canon Hedley reported to the Bishop on the results of his visitation on May 13th. He expressed his willingness to Bishop Sweeny to take charge of the district as an independent parochial mission in conjunction with half time duty under the D.S.C.R. This he was commissioned to do, as priest in charge, from June 1st, 1921. 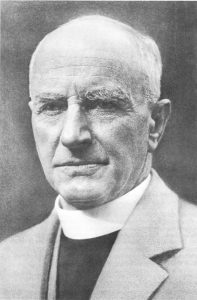 The Reverend Canon Charles W. Hedley, the founding rector of the Parish (1921-1936). On June 1st, Rev. 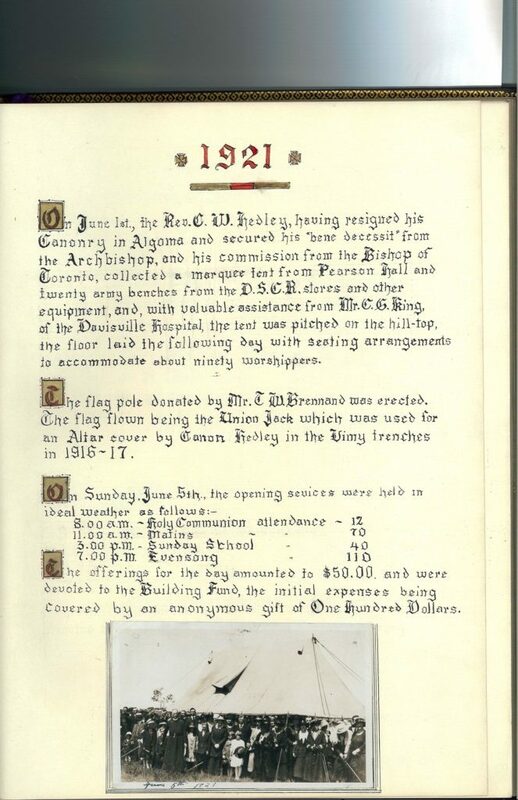 C. W. Hedley having resigned his Canonry in Algoma and secured his “Bene Decessit” from the Archbishop and his commission from the Bishop of Toronto collected a marquee, twenty army benches and other equipment from D.S.C.R. stores. With valuable assistance from Mr. C. Grant King of Davisville Hospital the Church tent was raised. The next day a flagpole donated by Mr. F. W. Brennand was raised. There were many offers of help and equipment for the new mission. By Saturday the tent flooring was finished and seating had been arranged to accommodate about ninety worshippers. On the Sunday the opening services were held in ideal weather. The services were very well attended and could hardly have been more encouraging. The congregation for the evening service overflowed from the tent to the hillside. I would like to quote from the Historical Records and Service Register 1921-1931, records that are on-file in our parish. This passage describes the services on the first day: “To the veterans present many features were reminiscent of France – the army tent and backless army benches, the simple service of familiar hymns. The flag flying over the hilltop was a Union Jack which served for the covering for a stone altar in Zivy Cave, 50 feet underground in the Vimy trenches within a quarter mile of the enemy in 1916-1917. The St. George flag on the altar served a similar purpose in Ypres cellars in the autumn of 1917. The altar cross was made by the pioneers of the 58th Battalion in France in 1916 – afterwards covered with brass, and the Altar vases were “Archie” shell cases. At a meeting held in the tent on the evening of June 16th, the members of the congregation voted Messrs. J. Weir Anderson and F. G. Parker into office as the first Rector’s Warden and People’s Warden respectively. This was for an interim period pending canonical organization. The formation of a Women’s Guild was deferred. To gather people together and to aid the building fund, it was decided to hold a garden party on the church site on Saturday, June 25th. Garden Parties were a feature of parish life until the early 1950’s. On June 21st, a meeting of the women of the congregation was held at the home of Mrs. Parker, 100 Manor Rd. A temporary organization of a Women’s Guild was set up. Officers were elected as follows: Mrs. F. G. Parker (President), Mrs. Brooks (Vice-President), and Mrs. Nash (Secretary-Treasurer). The baptism of Mary Georgina Kirby took place on Sunday, July 3rd at 4:00 p.m. This was the first baptism to be held on the church site. After evensong, plans were laid for the formation of the 58th Scout Troop. A meeting of the Men’s Committee was held the next evening at the Church site. It was decided to recommend to the congregation that work on the basement of the parish hall be started as soon as finances could be arranged. Bishop Sweeny chaired this gathering. Rev. C. W. Hedley introduced the question of a name for the new church and referred to the name proposed by the Bishop – “The Church of the Transfiguration”. His Lordship made a forceful and enthusiastic presentation of this name and suggested as a legal title “The Church of the Transfiguration and the Holy Mount”. After some discussion it was moved and carried to recommend to the congregation the adoption of this name. The Bishop said he was open minded as to the longer or shorter name. On the following Monday, July 11th, a meeting of the congregation was held in the tent. The name “Church of the Transfiguration” was adopted at this meeting. This was moved by Mr. McDougall and seconded by Mrs. Warden. Mr. Parker moved, and Mr. Graham seconded, a motion that a committee be appointed to wait on the Bishop, requesting the setting out of our parish bounds. It was moved by Mr. Nash and seconded by Mr. Tudball that the plans of the Church and Parish Hall prepared by the Architects (George Moorehouse and King) be adopted. These two motions were carried. The cost of the basement portion of the parish hall was estimated to be from $9,000 to $10,000. On the Friday prior to this meeting a hurricane which struck the city blew down the Church tent and inflicted severe damage to the canvas and poles. Temporary repairs were made to have it ready for Sunday Services. On July 12th the first financial campaign was planned and teams of canvassers were organized. The first Sunday School picnic was held on July 21st, on Sir Henry Pellatt’s farm at “Lake Marie”. Over two hundred people attended. On the last day of July, which was a Sunday, the Church tent was again blown down half an hour after morning service. Meanwhile, the financial campaign had commenced and subscriptions to date were $1,700. On August 7th, it was decided that the Architects be notified to take the necessary steps at once to get the building underway. A vestry meeting was held on August 22nd. The wardens and sidesmen and others who were acting in a temporary capacity were retained in their positions as permanent officers. Because the building committee was unwieldy in size, it was re-organized with a smaller number of people. Meanwhile, on August 9th, Mr. J. S. Galbraith was engaged as contractor. At this same meeting the turning of the first sod was done by Mr. J. G. Parker following a brief service by Rev. C. W. Hedley in the presence of a group of members of the congregation. Excavation work began during the remainder of the week. The stone for the building was selected from a quarry in the Credit Valley. During September the work on the building went on steadily but financial arrangements were unsettled. After an appeal by Rev. C. W. Hedley, members of the congregation loaned Victory Bonds to the amount of $3,750 to be used as collateral for a temporary bank loan. At the same time, Mr. W. C. Hunt offered to lend $4,000 to $5,000 on mortgage. This secured the amount necessary to build one storey of the parish hall. On Sunday, September 25th after morning services and Sunday School, held in a high wind which damaged the tent and imperiled the congregation, the tent was finally taken down. Evensong was held in York Masonic Hall which had been engaged for the interval until use could be made of the parish hall. Thus the year ended with construction well in hand and parish organizations begun. A distinguishing feature of the Church of the Transfiguration is at each step the church was built with the idea of permanency regardless of cost. This avoided the extra expense of temporary facilities. 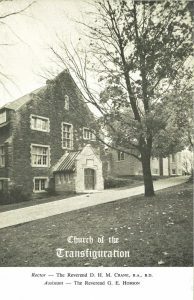 On January 1st, 1922, the new building was occupied and the first services held in the new stone church which was eventually to be the parish hall. There was also living accommodation for Rev. C. W. Hedley in the building. Four weeks later on Sunday, January 29th, Bishop Sweeny formally opened the new building. The dedication was at the 11:00 a.m. service. The parish service register shows 150 people attended Matins for this occasion. In May the first listing of the Church of the Transfiguration, Glebe Manor, appeared in the Toronto Synod Journal, showing Rev. C. W. Hedley as the first rector. One hundred and thirty people were present at the Induction Service of Rev. Hedley as Rector. During the year, the Scouts, Sunday School and Anglican Young People’s Association continued to grow. A Girl Guide Company was organized during the year by Mrs. Paine. This reflected the growth of the parish and the need for a larger building was readily recognized. With this in mind, plans were laid for a financial campaign which was held on May 7th, 8th, and 9th in 1923. On April 3rd, a Vestry meeting was held which approved the building of a two-storey addition to the east end of the existing parish hall. The first floor would be used to Sunday School, bazaars, Scouts, Guides and recreational activities. The second floor would be used as the Church with a seating capacity for three hundred people. The addition to be built was of permanent construction and was a step forward towards the goal of a Church and Hall worthy of the site. The objective of our parish was to build a large Parish Hall first and when it was completed to build a large Church on top of the hill proper. The two buildings were to be adjoining one another. The addition of these two storeys to the east end of the already existing building was an enlargement of the parish hall. A Vestry meeting was held on April 3rd. At this meeting the plans for the addition were approved and the Rector and Churchwardens were authorized to borrow the necessary funds to complete the extension, such sum not to exceed $30,000. On June 15th, at another Vestry meeting it was moved by Mr. Barrett, seconded by Mr. Berridge and carried unanimously – that following the Architects’ report the general contract be given to J. S. Galbraith at $28,000 plus the necessary amount for extra stone facing due to the boiler room being moved. Also it was moved and carried unanimously that the Rector and Churchwardens be authorized to let such other contracts as may be necessary and for which they can provide funds. A mortgage was taken out with the Ontario Commercial Travellers’ Association for the sum of $25,000 at 7% interest per annum. Construction was started and on January 25th, 1924, the new addition was dedicated by Bishop Sweeny. The service was held at 8:00 p.m. Rev. H. A. Brooke was the preacher. Also dedicated were an Altar Cross, Altar Desk, two Sanctuary Chairs, a Prayer Desk, and a Credence Table. During the year another canvass was conducted to raise money for the Building Fund. At this time there were four hundred families on the Parish roll with an Anglican population of about fourteen hundred. There were over three hundred children in the Sunday School. By now a Men’s Club had also formed. This shows how quickly the Parish had grown. Although meeting the payments due on the mortgage was a main concern, Rev. Hedley never lost sight of the main reason for the parish’s existence – spiritual progress and the deepening of the congregation’s spiritual life. In the latter part of the 1925 Lenten Season, a mission was held under the guidance of the Rev. F. L. Barber. Parish life and work was being carried on with a generally happy spirit and the number of families now reached four hundred and fifty, numbering about one thousand seven hundred and fifty people. During 1926 a Brownie Pack was started by Miss Walker It was around this time that Rev. Hedley arranged for part-time assistance from Rev. E. L. Wasson who was a Curate at the Church of the Messiah. In addition to his parish duties, Rev. Hedley was President of the Christie Street Hospital Branch of the Canadian Legion of the B.E.S.L. After the unveiling ceremony, Capt. Rev. C. K. Masters dedicated the tablet. Parish life continued to flourish and grow. Around this time the Ladies’ Badminton Club, the Girls’ Guild and the Font Roll were started. By the Autumn of 1928, plans were being made to complete the Church Hall because more space and facilities were required. In October the decision was taken to proceed with the additional construction during 1929. It was estimated the cost of this work would be $30,300. Contracts were let and work was started in the Spring. The west end of the building was carried up two storeys. This added four new rooms and also provided seating capacity for an additional one hundred and fifty people in the Church Hall for worship services. The 1920’s closed on a note of optimism and a feeling of great accomplishment. As a result of hard work and sacrifice the parish hall had been completed and the parish looked to the future when a new generation would carry on the work of building the church proper on the hilltop. As the 20’s gave way to the 30’s parish life continued to flourish. In a letter sent to the parishioners for Epiphany 1930, Canon Hedley mentioned the progress and accomplishments of 1929 and asked the congregation to make 1930 a year of spiritual progress. In his letter he outlined ways in which this could be accomplished. Around this time Mr. Lucas had a strong young men’s Bible Class. Mr. Arthur Hand, who recently retired as Lay Executive Officer and Director of Church Extension for the Diocese was active in young people’s work and the Brotherhood of St. Andrew. The Sunday School had an enrollment of 620 including 40 teachers. By 1931 there were 600 families on the parish roll, giving the congregation a membership of about 2,400 people. Nave and sanctuary before 1951. Towards the end of 1931, the economic storm which was affecting so much of society began to make itself felt in the parish finances. This was especially critical for the Church of the Transfiguration which had a large mortgage debt to be paid off. Although the parish was composed mainly of middle class people from the business and professional world and, therefore, would not be as badly hit as a working class area, nevertheless the records of the church show that the 30’s were a period of strain and hardship. It was not until 1940 or 1941 when prosperity returned with the war years, that the financial affairs of the parish began to cease being a constant stress and concern to those who bore the responsibility of parish administration. At the annual vestry meeting in January 1934 the wardens, Messrs. J. H. Brown and A. L. Elliott, reported that no payments had been made on the mortgage debt during 1933. As a way out of the difficulties, it was proposed that our site be used for a cathedral. In a letter dated December 30th, 1935, addressed to Mr. T. W. Brennand, R.W. Allin, the Secretary-Treasurer of the Diocese, said the idea of a future cathedral on our property was out of the question. He ended this letter by saying if our property was a burden to us the only thing to do was to sell it. However, there was also a bright side. The records from this period show an increase in church attendance and at the Easter Communion services. At the Parish Council meeting of November 7th, 1933, it was moved by Mr. Brennand and seconded by Mr. Hand that Rev. E. Wasson be approached with a view to accepting a position as assistant to Canon Hedley. These difficult times brought forth a cheerful faith and patience on the part of many people. Around 1935 the “Masquers Club” was an active drama club in the parish. An Economical Boomerang, Father Changes His Mind, The Man in the Bowler Hat, and The Ghost of Birdseye Center were some of the plays presented. Some of the people taking part in these productions were: Ronald Monkman, Allene Colwill, J. Wier Anderson, Jacquetta Hardy, A. B. Green, Margaret Fletcher, Frank Greenman, John McElheran, Arthur Jordan, Elieen Wootton, Mrs. Jordan, Ruth Fletcher, Bern Ellis, Hagar Ritchie, Vernon Lafete, Eleanor McGillicudy, George Smith, Reta McDonald, Leslie Brokenshire, and Jack Gould. Most of the monies raised were turned back to the church to aid the Organ Fund and for mortgage reduction. Also during this time concerts were performed by the Choir. With confidence in improved circumstances a new organ was purchased in the spring of 1935. A fund for this purchase had been established earlier. After the new organ had been installed, a special service of dedication was held. There were also active badminton and tennis clubs during these years. A financial campaign undertaken in the spring of 1934 produced disappointing results because of the economic conditions prevailing. The mortgage debt was over $40,000, local improvement taxes were in arrears and if this was not enough, there was an outstanding bank loan to be paid. However, the parishioners were undaunted and looked to the future. The Reverend Canon Everett L. Wasson, rector from 1936-1956. The year 1936 was marked by the retirement of Canon Hedley and the appointment of Mr. Wasson as our rector. Canon Hedley was born in 1866. In 1893, after having graduated from Trinity College, he was ordained to the Diaconate by Archbishop Sweatman. During the following year he was ordained to the Priesthood. Of his forty-three years in the ministry, sixteen were spent in Missionary Dioceses and five years in war service. In 1900 he went to British Columbia to become rector of Rossland. He was ten years in Port Arthur when he left to go overseas as an army chaplain. For a brief period after the war, he served as a curate at Christ Church, Brantford. Canon Hedley’s resignation took effect at the end of June. A gathering of the congregation and other friends outside the parish was held on the hill top in June when Canon Hedley was presented with a Plymouth car and a cheque, a gift from the congregation in appreciation of his work and the high esteem in which he was held by all with whom he came in contact. Unfortunately, Canon Hedley’s retirement was short-lived. In June of 1938, he was staying at a cottage at Stoney Lake in the Peterborough area. A fire broke out in a pine bush that fringed the cottage area. It is believed he was suffocated by smoke while endeavouring to get pails of water in a vain attempt to help extinguish the fire. At the time of his demise, he was dean of the Anglican College of the University of British Columbia. How unfortunate such a fine gentleman, who was so greatly admired, should suffer such a tragic death. Mr. Wasson began his incumbency upon Canon Hedley’s retirement. In spite of the heavy mortgage debt, he stressed that the parish should increase its givings to missions. Around 1938, a financial campaign was conducted for the sole purpose of raising money for mission work. This canvass was successful and the parish was able to meet its mission giving obligations set by Synod. An entry in the Toronto Synod Journal shows that in 1937 a Lectern Bible and Marker, Book of Offices and Marker, Flower Vases, Pulpit Light, Organ Light, Kneeling Cushions, Prayer Desk, and Communion Rail were dedicated. On Saturday afternoons before the war, several men of the parish spent their time clearing brush from the church grounds and burning it. Some of the men taking part were S. Allen, H. Mabee, R. Whitehouse, P. Phillips, J. Green, T. Topp, C. Hall, and G. Mercer. Much landscaping was done and the stonework on the Manor Road side by the driveway was put in. During the depression years relief work was carried on by the parish. At the service of Morning Prayer on Sunday, November 26th, 1939, a window symbolic of the Transfiguration of Our Lord was dedicated to the memory of Canon Hedley. The window is situated in the chancel above the reredos and was installed by a group of his friends. The design was by the Misses Yvonne Williams and Esther Mary Johnson. In the parish leaflet for the dedication service, the window is described as follows: “It contains between 1,500 and 1,700 separate pieces of glass, each of which is specifically treated and arranged so as to add to the spiritual interpretation of the Transfiguration. The central figure is that of Christ shown in whiteness as of light and around which is a radiation of golden rays, the rays of a glory that spreads to lighten the world, as it lightened and transformed His disciples. On the left is St. Peter standing and St. John kneeling, and on the right St. James. Each of these figures represents a type: Christ, The Light of the World, St. Peter, the thoughtful and kind, St. John, eager and impetuous youth, and St. James, the intellectual and intense. Also dedicated were the panelling and reredos in the Sanctuary. This was the work of Mr. H. Waines of Toronto, and was installed by the Chancel Guild and others. The parish is especially indebted to Mr. Somers who gave so freely and willingly of his time and work. Mr. Wasson conducted the service and the sermon was preached by Rev. F. H. Cosgrave, Provost of Trinity College. Assisting at the service was Rev. R. Seaborn of St. James Cathedral, who for a time was a student assistant at our church in the early 1920’s. Today, he is Bishop of Newfoundland. This service marked the end of the difficult depression years and faithful endeavours under trying circumstances. We who form the parish today owe a debt of gratitude and thanks to the parishioners of those lean years. The outbreak of the war at the end of the summer in 1939 signalled the beginning of the end of financial hardship. In the spring of 1940, the Church interior was painted for the first time. Mr. George Mercer and Mr. Bob Whitehouse canvassed the parish and raised one thousand dollars. During this time money was still being raised for the relief of clergy in the west and single unemployed men. Now the parish started to raise money for the Red Cross for soldiers’ Christmas boxes and other wartime charities. The women of the church did a great deal of work for the war effort. One of the main activities was the work of the Red Cross Club. In addition to knitting socks, gloves, sweaters, scarves and other items for servicemen, the ladies also sewed to make up clothing for people in the war-distressed areas overseas. Mrs. Livie and Mrs. F. Loach were two of the women who directed and organized this work. In the post-war years, parish life continued to flourish. On the social side, the choir and Men’s Club combined to put on minstrel shows during the late 1940’s. The A.Y.P.A. was revitalized under the direction of Rev. J. S. Cunningham, our curate. An event long looked forward to occurred at the service of Morning Prayer on Sunday, February 6th, 1949. This was the burning of the mortgage. It was the culmination of hard work, concern, and sacrifice through times both lean and good. Bishop G. A. Wells was the preacher for this occasion. Messrs. F. H. Marshall and R. V. Whitehouse, two former wardens, assisted Mr. Wasson in the ceremony. Installed as the new wardens during this service were Prof. F. N. Hughes and Mr. J. C. Ferguson as Rector’s Warden and People’s Warden respectively. The evening service on this very special day was a joint service at the Transfiguration with the congregation of Glebe Road United Church. It was a special service of testimony and worship. Four lay people, two from each church, spoke on “What the Church Means to Me.” The speakers from Glebe Road United were Mr. Noah Pitcher and Mrs. J. E. Jenkins and, from the Church of the Transfiguration, Mr. R. O. Lucas and Mrs. J. F. Trant gave their witness. Organist and Choirmaster K. W. Scott, A.C.C.O. During the late 1940’s and early 1950’s the choir competed in the Kiwanis Music Festival and took several prizes. Mr. Scott at this time was studying theology and subsequently entered the priesthood. Over the years different suggestions have been considered about the use of our large property. One of the more unique ones was five years or so after the war and reflects on the unsettled cold war conditions. The Department of National Defence made enquiries to the parish about construction of a bomb shelter and a depot for food and other essential supplies should an emergency arise. A feature of the parish life at this time, and reflecting the ecumenical movement, was joint services with Glebe Road United Church. Manor Road United Church also took part in these services from time to time. Total parish membership, including children, at this time stood at 1,300 people. Now that the mortgage had been paid off some needed renovations were carried out and in the summer of 1950 the wooden floor of the parish hall was replaced by terrazza flooring. Other renovations were also made at this time. In addition the congregation considered future developments of the parish. At a vestry meeting in the early 1950’s the decision was taken to use the present building as the permanent church and not to proceed with the building of a large church on top of the hill as had been planned in the early years. The feeling was the congregation would not increase in size and the present building was sufficient for the parish’s needs. Accordingly work went ahead to make considerable changes in the church. In the summer of 1952, the old wooden movie seats that had been obtained from a movie house on Mt. Pleasant Road were removed. This work was done by the men of the congregation. Those who took part will remember it as a night of long hard work. Services were held in the Canon Hedley Room until the pews were installed and the renovations were completed. In 1946 a sum of money was set aside by the congregation to furnish a chapel in memory of the eight men from the Church of the Transfiguration who fell in the war. This chapel was to have been a part of the proposed large church. It was decided to use the money for furnishings in the present church. These consist of the panelling in the Sanctuary and Chancel, the choir screen and memorial corner, the Pulpit, and the pews in the Baptistry and South Transept. The reredos, a wooden carving of the Last Supper, was given in memory of Mabel C. Wasson by the Rev. E. L. Wasson and her two nephews, Clayton and Allan Farewell. Mrs. Lila F. Maltby Senior A.Y.P.A. Dr. & Mrs. E. J. Maltby Junior A.Y.P.A. The Organ was also completed during 1952 and so our Church took on the appearance as we know it today. All the above furnishings and the organ were dedicated to the greater Glory and Worship of God at a special dedication service at 11:00AM on Sunday, November 9th, 1952. Those taking part in the service were: Bishop Beverly, Bishop of Toronto, Rev. E. L. Wasson, our Rector, George Mercer, Rector’s Warden, J. F. Trant, People’s Warden, Donald P. Hunt, Student Assistant, and J. S. Whitehouse, Student Assistant. The year ended with an Ordination Service on St. Thomas the Apostle Day, December 21st. The candidates presented at this service were Rev. John Barclay, for the Office of Priest, Stanley Whitehouse, John Speers, Paul Moore, and Meron Buchanan, for the office of Deacon. Bishop Wells was the Ordaining Bishop. The following assisted him: Provost R. S. K. Seeley, of Trinity College, Principal W. R. R. Armitage of Wycliffe College, Dean R. F. Hettlinger, Dean C. Fielding, Rev. C. de Catanzaro, Rev. D. P. Hunt, Rev. M. T. Newby, and Rev. E. L. Wasson. This was the first ordination service in our parish church. It was around 1952 or 1953 that our Church site was landscaped. We are indeed fortunate to have such a beautiful location. On the 3rd of July, 1952, the Deed conveying Land Block “A” Registered Plan 1789 by the Incorporated Synod of the Diocese of Toronto was turned over to the incumbent and churchwardens of the Church of the Transfiguration. This document is now held by the Synod. Early in 1953, our church had the honour of a visit by the Right Reverend A. A. Scott, the Moderator of the United Church of Canada, to preach at the evening service on Sunday, January 18th. The congregation of Glebe Road United and Manor Road joined with us for the service. The Choir of Glebe Road United combined with our choir for the musical portion of the service. The Rev. R. H. Parr of Glebe Road United and the Rev. R. F. Hicks of Manor Road United, along with the Rev. E. L. Wasson and the Rev. D. P. Hunt also took part in the service. On the first Sunday in June of 1954, marking our thirty-third anniversary, Bishop Wilkinson, Coadjutor Bishop of the Diocese of Toronto, dedicated two memorial windows at the morning service. One window in the Baptistry symbolizes Christ as the Good Shepherd. This window was given by Gladys and Robert Whitehouse in memory of Josep B. Laviolette and William B. Whitehouse. The other window, at the Remembrance Desk, symbolizes the Spirit of Christian Sacrifice. This window was given by Isabel Warden in memory of Gilbert Tom Warden and Eva Warden. The persons mentioned in the second window all attended the first service in this parish on June 5th, 1921. The Reverend A. Gordon Baker, our assistant was ordained into the Priesthood at a service in our parish church. The service was conducted by Bishop Waterman of the Diocese of Nova Scotia. The following clergy assisted: the Rector, Rev. E. L. Wasson, Rev. A. N. Thompson, Rev. R. A. Ward, Rev. G. A. Steele, Rev. C. F. Preston, Rev. D. P. Hunt, Rev. J. G. Rowe, Rev. R. J. Newsham. This service was at 10:30AM on Saturday, November 20th, 1954. On the Sunday of the following weekend, November 28th, Bishop Watts of the Diocese of Caledonia, dedicated a memorial window in the Baptistry, given by the family of the late Mr. & Mrs. Thomas Brennand. The scenes in this window are illustrations from the childhood of our Saviour – The Mother and Child, The Flight into Egypt, Jesus in the Home and In the Carpenter Shop. As it was for the churches in general, the period of the 1950’s was a time of good progress for the Church of the Transfiguration. Attendance at services was high, the Church School had a large enrollment, and the many parish organizations were flourishing. A parish library was begun to enable parishioners to have access to a large number of books dealing with a wide range of religious topics. During this period a number of financial campaigns were held. The times were prosperous and these campaigns were all successful. In 1956 Mr. Wasson announced his retirement, effective on September 1st. Shortly before his retirement he was made a Canon of the Diocese of Toronto. Canon Wasson is a native of New Brunswick. As a young man he enlisted in the army during the First World War. While serving overseas, he was wounded and taken prisoner. As a prisoner of war he endured great hardship. After the war, he studied at the University of Toronto and entered the Priesthood. In 1923, he became assistant at the Church of the Messiah. During his twenty years as rector, Canon Wasson endeared himself to the congregation and is warmly remembered by those who knew him and worked with him. The Reverend L. S. Garnsworthy succeeded Canon Wasson and took up his duties at the Transfiguration at the beginning of September. Prior to this he had been rector of St. Nicholas Church, Birchcliff, in Scarborough. On November 21st, Mr. Garnsworthy was inducted as rector of the parish by the Right Reverend Frederick H. Wilkinson, Bishop of Toronto. The preacher was the Rev. Canon F. J. Nicholson, rector of the Church of St. Michael and All Angels. The following clergy were in attendance: The Ven. Archdeacon A. C. McCollum, The Rev. Canon H. H. Marsh, The Rev. Canon E. L. Wasson, The Rev. J. DeP. Wright, The Rev. E. G. Robinson, The Rev. F. C. Mulkin, The Rev. C. A. Mitchell, The Rev. Principal Ramsay Armitage, The Rev. D. H. M. Crane, The Rev. Canon F. A. Smith, The Rev. H. N. Bracken, The Rev. E. H. Clifford, The Rev. J. Gregory lee, The Rev. J. A. Roney, The Rev. R. T. Nishimura. The wardens at this time were Messrs. A. M. Ross, and F. T. Simmers. 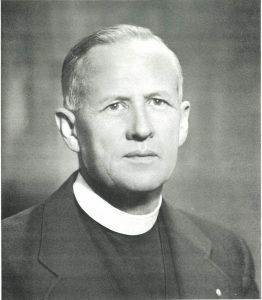 The Reverend Lewis S. Garnsworthy, rector from 1956-1960. During the year 1956-1957 we had as our curate the Reverend Hugh MacLean who had formerly been a captain in the Salvation Army. He had been assistant editor for the War Cry and had served in the West Indies and Canada. On December 1st, 1957, at the eleven o’clock service, a stained glass window, located on the north side of the church near the pulpit, was dedicated by Bishop Wilkinson of the Diocese of Toronto. The window was the gift of the congregation and is a token of thanksgiving for the devoted ministry of the Reverend Canon E. L. Wasson. The subject of the window is “Our Hope in Christ.” The interwoven text is taken from the prologue of the Gospel according to St. John – vv. 4-5 and the 31st Chapter of the book of the prophet Jeremiah vv. 1 and 33. The window was designed and executed by Gustav Weisman in the Yvonne Williams Studio. In the spring of 1959, two stained glass windows were dedicated. One window, depicting the Resurrection, was given in loving memory of Pte. Edward Samuel Smith by his wife. The other window depicts Christ appearing to Mary Magdalene and was given in loving memory of Lillian and Peter Livie by the Livie family. At this same service leaded windows, given to the Glory of God and in thanksgiving by the Women’s Groups of the Parish, the A.Y.P.A. and the Junior Auxiliary were also presented. These windows were all dedicated at the service of Evensong on April 19th, 1959. The special preacher was the Rev. T. P. Crosthwaite, rector of St. Clement’s Church in North Toronto. After a brief ministry of only three and a half years, Mr. Garnsworthy was moved to the Parish of St. John’s York Mills. Mr. Garnsworthy was popular throughout the parish and is well-remembered for his special gift of preaching. Subsequently he became a Canon of the Diocese, and on St. Andrew’s Day, 1968, he was consecrated Bishop at St. James Cathedral. Presently he is Suffragan Bishop of the Diocese of Toronto. 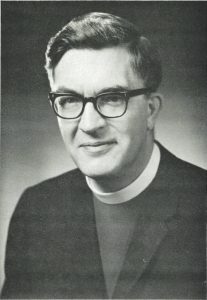 The Reverend David H. M. Crane, rector from 1960-1972. Our present rector, the Rev. D. H. M. Crane, was inducted on Friday, March 25th, 1960 by Bishop Wilkinson. Rev. J. E. Speers, of Trinity Church, Aurora, was the special preacher. At this time, Mr. C. E. Bailey and Mr. A. C. Thompson were the wardens. Our organist was Mr. M. White. The following clergy attended: The Rev. Canon H. H. Marsh, Rural Dean of Eglinton, Principal L. Hunt, of Wycliffe College, Rev. Canon E. L. Wasson, Rev. Canon S. K. Styles, Rev. Canon F. A. Smith, Rev. G. W. Philpotts, Rev. J. R. Moore, Rev. W. R. Symons, Rev. S. Oliver, Rev. H. N. Bracken, Rev. J. R. Thompson, Rev. J. Purser, Rev. W. R. Flynn, Rev. D. W. Luxton, Rev. R. W. Scott, Rev. P. Trant, Rev. F. N. Kennedy, and Rev. B. C. Brightling. Mr. Crane is a native of Toronto. After graduating from University College, he studied theology at Wycliffe College. After graduation he spent five years in the Diocese of Niagara. After this he was at Penetang. Prior to his ministry at the Church of the Transfiguration he was rector of St. Christopher’s Church, Downsview. From 1960 to 1962 our curate was the Rev. Phillip Whitney. He and his wife, Sally, a graduate of the Anglican Women’s Training College, performed an outstanding ministry to the youth of our parish. A club named the Transfiguration Teen’s Club was formed and fifty young people turned out for a Bible Class on Sunday mornings. 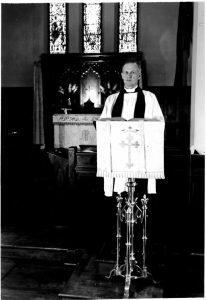 For our fortieth anniversary Sunday in 1961, Canon Wasson returned to preach at the morning service and the Rev. K. W. Scott preached at the evening service. In the spring of 1962, our association with the 58th Battalion was recalled. The Royal Regiment of Canada, which carries on the traditions of a number of infantry regiments including the 58th Battalion, celebrated its 100th anniversary. The Royal Regiment, as part o fits centennial celebrations, was granted the Freedom of the City of Toronto. The Regiment gave a copy of the scroll granting the Freedom of the City to the Church of the Transfiguration. The parish was also given a copy of the book “Battle Royal, A history of the Royal Regiment of Canada 1862-1962” by Major D. J. Goodspeed, C. D. Both these items are on display in the memorial corner of the church. The same year saw our dream of a new extension come alive. This had been planned for since the latter years of the 1950’s. Construction was started in the spring and was completed in the autumn. The construction is in stone the same as our original building. Over five hundred people assembled in the church on November 15th at 8:00PM. Bishop Wilkinson dedicated the extension. The architect was Harold Savage. The builders were Graham and Sibbett. The extension includes six new rooms for the Church School, offices, a reception room, a board room, and enlarged narthex, a sacristy, and a memorial chapel. Memorials were dedicated as follows: the pews in the chapel in memory of Herbert Charles McDowell; the Altar in memory of Sarah Ann Brum; Altar Rails in memory of Joey MacLain; and a chalice and paten in memory of R. V. Whitehouse. At this time our curate was the Rev. E. Hobson, one of the first men to graduate from the Diocesan Training School. This school trained older men to enter the ministry. Mr. Crane was a lecturer at this school which prepared a number of men for the priesthood during the 1960’s. At a service of Morning Prayer in mid-January 1962, a window in the Baptistry, in loving memory of Roland Thomas White and his wife Ellen, and Albert George Franklin and his wife Louisa, was dedicated. The Rev. L. Garnsworthy, our former rector, was the preacher on this occasion. In the spring of 1963, a new memorial window was dedicated on Sunday, May 26th. It depicts the Ascension of Our Lord and was dedicated by Canon F. A. Smith, our Rural Dean, to the Glory of God and in loving memory of Robert Victor Whitehouse. Mr. Whitehouse was a former warden and a long-time member of the parish. The window was given by Gladys Whitehouse, his wife, and is the work of Yvonne Williams. 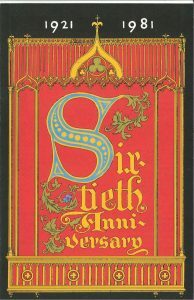 Nineteen-sixty-three is remembered for the Anglican World Congress. Mr. Crane had the privilege to be a chaplain to the Archbishop of Canterbury. As one of our guest preachers at this time, our parish was honoured to have the Bishop of Connecticut. Mr. Gordon Green was the parish coordinator for Congress activities. In the middle of the 1960’s, the parish began to undergo great changes. As had happened in many parts of Toronto, our community is changing from single family dwellings to high rise apartments. This has caused a great turnover in our members. Similar to other churches, the Transfiguration finds it difficult to contact the newcomers in the many apartments in the neighbourhood. The next dedication of a window was in early 1965. Bishop Wilkinson dedicated this window given by Mr. and Mrs. Harry Edwards on February 14th. The window depicts “Our Lord as Teacher”. He is seated among the people in the context of the Sermon on the Mount. He is dealing with the question of the significance of life. Woven into the picture is the text, “Is not the life more than the meat – Seek ye first the Kingdom of God and His Righteousness.” In the autumn of 1965 the kneelers were covered. This project was financed, in part, by the Women’s Organizations of the Church of the Transfiguration, the Octa Group, and by donations from memorial funds as follows: Mr. L. Cook and family, in memory of Mrs. Cook; Mrs. F. A. Belfry, in memory of Mr. F. A. Belfry; Mrs. J. Hilton, in memory of Mr. Jack Hilton; and Mrs. A. L. Beecroft, in memory of Mr. A. L. Beecroft. In March of 1967, a new Bible for the Lectern was given in memory of Marguerite Eddis Cook by Mr. L. Cook and daughters. In 1966 members of the church began volunteer work for “Meals on Wheels”. This work involves taking meals to shut-ins in the inner city. All denominations co-operate in this project. The headquarters for this work is St. Luke’s United Church. Mrs. Molly Magee of our church is in charge of the people who deliver the food to the shut-in people. Twenty parishioners from our church now take part in this activity. In 1968, a major renovation was done to the parish hall to give it an attractive appearance. Other redecorating was also carried out and the parking lot was paved. During the same year, the Anglican Church Women’s group was formed in our Parish. This was a joining together of the W. A. and the independent women’s group in the Church. Mrs. W. Stewart was the first president of this new group. After the eleven o’clock service one Sunday in early May of 1970, a reception was held in the Parish Hall. At this time, the parish presented Mr. Crane with an executive style office chair and an engraved silver salver in honour of the twenty-fifth anniversary of his ordination. Mrs. Crane received a bouquet of roses. Dean F. N. Hughes was the master of ceremonies for this happy occasion. At the end of the year on December 6th, our church participated in a modern expression of religious music in the form of the “Touch Mass” written by Mr. David Warrack. The service was well-received and was repeated on January 3rd of this year, at which time the service was telecast live over the C.B.C. Change occurred in the Parish in the autumn of 1972 when Canon David Crane left to become rector of St. Simon’s Church in the east end of Toronto. Because of his excellent spiritual guidance during the upheavals of the 1960’s, it was with regret that the Parish bid farewell to Canon and Mrs. Crane. Until the arrival of Canon Lemon on the following February 1st, the Reverend Dr. R. K. Harrison was in charge of the Parish. Dr. Harrison has been Honorary Assistant at the Transfiguration since 1964. Our Parish Church was well served by him at this time. In addition to his duties as Professor of Old Testament at the Toronto School of Theology at Wycliffe College, Dr. Harrison devoted considerable time to the Parish. He started a musical group for the young people, attended meetings of the Advisory Council, conducted the regular schedule of services and ensured the affairs of the Parish were well looked after. It was his concern that when the new rector arrived, it would be a vibrant church. In the winter of 1973, our present rector, Canon Lemon, came to the Transfiguration. All his ministry has been in the diocese of Toronto. He is a graduate of University College and the University of Toronto. Canon Lemon is an Honours Graduate of Wycliffe College and recipient of the degree of Bachelor of Divinity from General Synod. His service started in the Parish of Stayner. He initiated and founded the Parish of St. Hilary’s in Mississauga. He came to us from St. Paul’s, Lindsay and was the Regional Dean of Victoria and Haliburton. Canon Lemon is a native of Orangeville, Ontario. 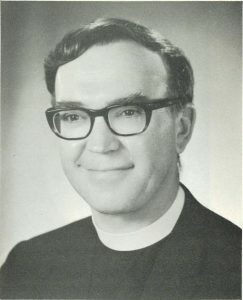 The Reverend David E. Lemon, rector from 1973-1990. It was on February 1st, 1973 that Canon Lemon and his family arrived. At the evening service on March 4th he was inducted as Rector of the Church of the Transfiguration. The Archdeacon of York officiated. The preacher was the Ven. J. C. Clough, Archdeacon of Peterborough. A number of other clergy were present. The service was followed by a reception in the Parish Hall. It was in November of 1972 that the Rev. David Lemon was made a Canon of the Cathedral of St. James. On Sunday, May 13th, the two remaining windows in the South transept were dedicated. These new stained glass windows are to the Glory of God and in loving memory of Rhoda Ann Smith and Nelson Stephenson. A pleasant social event was an Open House at the Rectory one Sunday afternoon in May. The Lemons opened their home to the members of the church for a social get-together. Several of the ladies helped with the refreshments. One evening in June a Strawberry Festival took place on the church grounds. The Raymond Family Steel Band provided musical entertainment for our enjoyment. In late May the Parish was saddened to hear of the tragic death of Jonathan Halse, who had formerly been our student assistant, shortly after his ordination. Especially saddened were the young people with whom he had worked. This year the Harvest Festival Service was observed at 11:00 a.m. For Evening Prayer, Bishop Read paid his first visit to us since his consecration. Those present enjoyed not only his sermon but chatting with him after the service had ended. Three weeks later on October 21st, our special preacher for Morning Prayer was the Reverend David Luck, the new Dean of Wycliffe College. A new feature of parish life was the start of a badminton club. Over the years several parishioners have enjoyed fellowship with one another. The club plays on Friday nights during the autumn and winter months. Some years a closing get-together has been held at the house of Barbara and Art Marshall near Fenelon Falls. A social activity involving the church in the life of our community has been meetings of the Harmony Club for senior citizens in our building. To afford an opportunity for lay people to participate actively in worship, Canon Lemon has recruited parishioners to read one of the lessons during Morning Prayer and 11:00 a.m. services of Holy Communion. Over the years the response to this has grown and the number of readers has increased. At the 1974 Vestry Meeting, a Gifts and Memorials Committee was established. Its purpose was to consider the needs, aims, and direction of the Parish with the purpose of making suggestions and considering gifts and donations to the church as memorials or thank offerings. To this end it was proposed to compile a complete, up-to-date record of all such gifts and memorials. During the winter we enjoyed a visit by Bishop Read and his wife. This was a social gathering in the form of a dinner followed by a talk by the Bishop of a recent trip to Britain. The mood was set by large travel posters of Britain on display, tables festooned with spring flowers and soft melodic music in the background. Thanks to Molly Magee, Marion Fowler, and Marjorie Green many of the parishioners became involved. Mrs. Culley was the pianist for the evening. On Sunday, June 16th, the 11:00 a.m. service was held outdoors on the hill. The Raymond Family Steel Band provided the musical accompaniment for the choir. Following the outdoor service held in June during our fiftieth anniversary year a June service has become a regular feature of parish life. Glebe Road United and Glebe Presbyterian churches join with us on these occasions. Our beautiful grounds provide a perfect setting for the worship of God. During this period, Janet Magee was chairwoman of “The Visitors”, a small but devoted group whose purpose is to visit the shut-ins and those handicapped by chronic illness who are members of the parish. These visits help them feel they are still a part of the parish life and to meet any needs they might have. The group meets several times a year to talk about mutual concerns and to try to improve skills. On the weekend of November 26th, people of the parish availed themselves of an opportunity for spiritual development by going, as a group, to the Aurora Centre. There was a good representation of the organizations and activities of the parish. There was plenty of opportunity to get to know one another and to learn of concern for other people and also support from them. In the autumn of 1974, John Brownhill came to us as a student assistant. To mark the Week of Prayer for Christian Unity during the following winter, the Reverend Kenneth Rolland, Minister of Glebe Road Presbyterian Church, preached at the service of Morning Prayer. On a Sunday in mid-February, our guest preacher for the 11:00 a.m. service was the Reverend Wm. MacKenzie, Chaplain of Hart House and Diocesan Theologian. Coffee hours followed both these services. For the Lenten program this year, Canon Lemon combined a series of Sunday morning addresses with a fellowship hour following the mid-evening Communion. This provided people an opportunity to respond to the Sunday morning sermons. A current parish bulletin noted that Dr. Elizabeth Leach and Dean Hughes had been appointed to the Bishop’s Candidates’ Committee for the Diocese of Toronto. Another parish bulletin explained the organization of our parish Anglican Church Women. Under the direction of the Executive, the women of the parish are divided into five groups: Forward Group, Winchester Group, Book Group, Friendly Group, and the Chancel Guild. Sunday evening, March 16th, was Yukon night. Mark Lemon presented a beautiful and interesting set of slides of the Yukon. Of particular interest was the work accomplished, under the Outreach Programme, by the young people for the Diocese of the Yukon. A goodly number of people enjoyed the slides and also seeing a staff which Mark had found in an old river bed and later embellished with figures from the stained glass windows in the church at Carcross. Mark’s sketch of a “sourdough” panning for gold was fittingly displayed. Years ago, Mrs. Wasson, the wife of our former rector, presented to the church an old painting thought to be from the Renaissance period. Thanks to the Winchester Group, the painting was restored and returned to its place on the wall in the left transept close by the Baptistry. 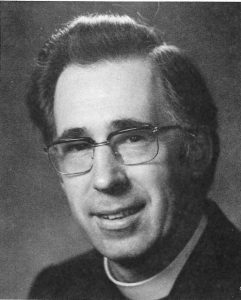 At the end of April, Charles Balfour graduated from Wycliffe College and was ordained Deacon on May 20th, 1975 at St. Patrick’s Church in Willowdale. After his ordination, he commenced a curacy at St. Andrew’s Church, Scarborough. An outstanding event in our parish story was on October 12th when Mr. Malcolm Muggeridge delivered the sermon at the morning service. It was through the kind offices of Mr. Pat Ferns that Mr. Muggeridge came to our church. During World War II he served in the Intelligence Corps. and attained the rank of Major. He was awarded the Legion d’Honneur and the Croix de Guerre. Three parishioners were honoured during the fall season. The Faculty of Pharmacy and the Pharmacy Alumni Association of the University of Toronto named the Pharmacy Building “The F. Normal Hughes Pharmacy Building”. The Soroptimist Club of Toronto named Mrs. Janet Magee as an Outstanding Ontario Woman for her contribution to the community. Mrs. Marjory Duncan was recognized by the Women’s Auxiliary of the Sick Children’s Hospital for her contribution of more than three hundred Raggedy Ann dolls for the hospital’s gift shop. Our heartiest congratulations to go these people. A welcome addition to the fabric of our church building was the installation of a public address system for use during worship services. At the Vestry Meeting in 1976, approval was given to proceed with major repairs and improvements to our church organ. Additional pipes and power were added. The raising of the Sanctuary arch and the creation of openings in the Sanctuary walls were structural changes which permit us to get more sound from the organ. The cost of this work was around seventeen thousand dollars. Thanks to an excellent response from the congregation, enough additional funds came in to purchase new choir gowns. On a Sunday evening in March, the film “An Ark for Our Time” was shown at the church. This excellent movie was produced by Nielsen-Ferns Ltd. It is about the Jean Vanier Institute in Larche, France. Dialogue is by Malcolm Muggeridge. An opportunity for learning and fellowship was provided on the afternoon of April 3rd. The Chancel Guild held a display of church linens, vestments, and ornaments in the auditorium. After the showing, refreshments were served. On a Sunday in May we celebrated a milestone in the life of Canon and Mrs. Lemon. The joyful occasion marked the 25th Anniversary of Canon Lemon’s ordination to the Priesthood and the Silver Wedding Anniversary of Canon and Mrs. Lemon. Our guest preacher this day was the Rev. Hope Surdivall of St. Peter’s Church, Erindale. “A day of happiness, good humour, loving gifts and a reunion of old friends” was Canon Lemon’s comment in the Parish Newsletter. Just as deflation was a hallmark of the 1930’s, so has inflation been a hallmark of the 1970’s. This theme runs through the treasurer’s and Wardens’ reports that I have read for background material. The loyalty and generosity of our parishioners during this period has never failed and our obligations have always been met. Special mention and thanks are due to the women of the church. As always, they work hard and contribute not only financially but to the organization and successful operation of many events in our parish life. Their faithful service throughout the whole life of the parish has been a constant source of strength and vitality to the Church of the Transfiguration. In the spring the Advisory Council selected two Outreach Programmes. The first was “The Church in the Sudan and the Middle East”. The church in the Sudan had been through seventeen years of civil war. Canadian support for basic pastoral care in the area was deeply appreciated. The second was “Native Peoples in Canada”. Money given to this project supports language study in Vancouver, a mini-bus for Sunday School on an Alberta reserved, and a children’s after-school programme in Toronto. Aid also goes to a home for girls coming to the city from the reserve, as well as participation in cultural and spiritual events. For our Harvest Thanksgiving Service, Bishop Garnsworthy and his wife were present. The Bishop rededicated the organ. The coffee hour after this truly glorious service enabled many to renew acquaintances with Bishop and Mrs. Garnsworthy. Advent Sunday was marked by the lighting of the first candle of the Advent Wreath. On each of the four Sundays of the Advent Season an additional purple candle is lighted. This culminates with the lighting of a white candle in the centre of the wreath at the service of Holy Communion on Christmas Eve. The Advent Wreath is now used every year to enhance our worship. In the winter of 1977, the Women’s World Day of Prayer was held in our Church. A new feature of the Holy Week services this year was the holding of joint services each evening from Monday to Thursday inclusive with the other churches in the immediate community. The services were held at Glebe Road United Church, Glebe Presbyterian Church, the Church of the Transfiguration, and Manor Road United Church respectively. On Sunday, May 1st, in the latter part of the afternoon, a High Tea was held for newcomers in the Fellowship Room. Forty people mingled together and formed new friendships. Refreshments were served. Scenes from the Passion Play at Oberammergau were shown. It was hoped to have similar events later on. One day in the spring, the “younger set” went out for dinner to a Chinese restaurant in New Chinatown. The group were at the mercy of Felicia Sutherland. She was the only member who could speak Chinese. After having eaten, the group spent the evening at the house of Jenny and Pat Ferns. The Rector endeavoured to answer some incisive and thought-provoking questions. In the autumn, the film “Dostoevsky with Malcolm Muggeridge” was shown. This documentary, filmed on location in Russia, deals with the life and work of this great Russian novelist. The film was shown after a dinner sponsored by the A. C. W.
During the year, Bishop Harris of Northern Argentina visited the Church of the Transfiguration. He was met by a group of people interested in the work of the Anglican Church in South America. Representatives from Wycliffe College, St. Bride’s, St. Phillip’s (Etobicoke), Christ Church (Woodbridge), Bolton, St. Barnabas (Danforth), and our own parish were present. All present were impressed with the sincerity and ability of the Bishop, who had been invited by Bishop Garnsworthy. In October a “Get Acquainted” dinner party for young couples and singles was held at the Rectory. The arrangements were done by Marcia and John Brownhill, and Janet and Ronald Howes. The group held a theatre night towards the end of October. On October 22nd Mrs. Janet Magee was honoured on her 80th birthday. Representatives from the wider community were present in the auditorium and included members of the Merton Street Study Group. They presented her with a silver tray. A thoughtful address outlined her many achievements. The latest of these was the development of land on Merton Street into a Senior Citizen’s Housing complex. Bishop Hunt, the Rev. Stanley Whitehouse, the Rev. Dr. Harrison and the Rev. Canon Lemon were some of the clergy present. On Sunday, December 11th, the annual Children’s Christmas Service was held. This was followed by the Christmas Party for the Sunday School and snack luncheon for the adults. At the Advisory Council meeting in March 1978, those present voted to direct the Parish’s Outreach support to the mission work in South America. The parish had been in personal correspondence with Bishop Harris. To promote interest in this work, a visual display was set up in the narthex. After Morning Prayer on a Sunday in mid-April, Miss Thomas, our secretary, was honoured upon her retirement. On behalf of the Rector, Mrs. Lemon presented her with a bouquet of flowers. The book “Toronto, No Mean City” by Eric Arthur, was presented by Marina Groulx for the members of the A. C. W. The Wardens presented Miss Thomas a cheque as the gift of the congregation. A presentation was also made by the Rev. Prof. Harrison who had begun a year’s sabbatical leave in January. When he presented a cheque to Dr. Harrison, a gift from the parishioners, Mr. Paterson Ferns expressed the good wishes of all those present for a successful trip to Israel and the subsequent publishing of his latest work. Dr. Harrison replied with his usual good humour and graciousness. On a sunny Sunday afternoon in May, Canon and Mrs. Lemon held “Open House” at the Rectory to celebrate five years at the Transfiguration. It was a most enjoyable reception and afforded an opportunity for the people of the Parish to meet one another in a relaxed atmosphere. In memory of the life and contribution of Mr. Jack Beer to the Church of the Transfiguration, a scroll done in old English printing hangs above the centre door of the narthex. It is a quotation from Psalm 100 and reads: “ENTER INTO HIS GATES WITH THANKSGIVING, AND UNTO HIS COURTS WITH PRAISE.” Mr. Leonard Wheeler executed this work and had it framed and presented to the Church. On October 1st a Harvest Evensong was held at 4:00 p.m. for the shut-ins of the Parish. Refreshments and a time of fellowship followed. The afternoon sun helped create a wonderful light in the Church and gave the service a feeling of holiness. I was present as a Sidesman and have always remembered that afternoon. Later on in October, Bishop Read visited the Parish for an afternoon and evening. He and Canon Lemon visited some of the parishioners during the afternoon. In the evening a pot luck supper was held for all the congregation. Afterwards Bishop Read showed slides of the recently held Lambeth Conference and talked to us about the growth of the Anglican Communion. He mentioned the restrictions and formidable difficulties still faced by many missionaries in the modern world. We should all thank God for the freedom we have to be Christians in Canada. During the autumn an original oil painting depicting the Resurrection was presented to the Church. The painting was done by Mark Lemon and represents his impression of Christ’s Resurrection. The picture provides much food for thought. In November Dr. Harrison spoke to us of his trip to the Holy Land and other sites. It was on a Sunday evening. A service of Family Prayer was held first . Slides were shown in addition to the talk. The evening was most enjoyable and informative. In early November, Canon Lemon attended the School of Preachers at the National Cathedral in Washington, D.C. It was an intense but refreshing course on the improvement of communication skills. The participants included clergy from all across the United States as well as Great Britain. A deeper appreciation of the breadth of the church was an important by-product of the school. The year ended with a number of Parish organizations, such as the Winchester Group and the Choir, holding Christmas parties. The annual Carol Candlelight Service was held on December 17th. This is always a beautiful service and much enjoyed by the congregation. In January of the New Year, Mr. Ross resigned his position of Parish Treasurer. Mr. Dugald Henderson took his place. To honour Mr. Ross, the Fellowship Room was renamed the “Max Ross Fellowship Room”. When Bishop Read visited Eglinton Deanery over the last weekend in February, our Servers’ Guild attended the Servers’ Festival held at St. Cuthbert’s Church on the Sunday afternoon. On the same evening seven people from the Transfiguration were confirmed by Bishop Read at St. Timothy’s Church. In the spring, a significant gift to the worship of our Parish was given. This was a Processional Cross in memory of the late Mr. A. C. Thompson, a former warden. The Advisory Council voted to accept this gift. It was first used in April. Prior to its use the Rector gave a brief explanation of its use and meaning. Also, during April, John Brownhill, our student assistant, graduated in theology from Trinity College. His ordination to the Diocanate was by Bishop Read on St. Eric’s Day, May 18th at St. Anne’s Church in the west end of Toronto. On June 1st he commenced an assistant curacy at All Saint’s Church, Peterborough. Our prayers continue to be with John and Marcia in their new parish. Old friendships were renewed when we welcomed the return of Canon Crane for a “Special Evening” and the dedication of the Max Ross Fellowship Room. In June, an event of importance to the future of the whole Christian Church took place in Toronto. A Joint Conference of clergy and laity from the Anglican and Roman Catholic Dioceses was held. Two hundred delegates from each denomination were in attendance. The theme was “What We Hold In Common”. This was the first meeting of its kind ever held. As the summer moved along, several parishioners felt the Church of the Transfiguration should respond in a natural way to tragic events currently taking place in Southeast Asia. In September a special meeting of the Advisory Council was called to consider a course of action to be followed. From the Council’s deliberations sprang “The Transfiguration Boat People Committee”. The new Committee was charged with formulating a plan of action. Mr. Malcolm Sutherland became the chairman. The Advisory Council was to be kept informed of the Committee’s activities. The autumn was a busy season. There was the annual Harvest Thanksgiving Service. The Fall Bazaar and luncheon provided an opportunity to renew old friendships and to form new ones to develop talents for the men and women who worked so long to make it a success. At the service of Morning Prayer on the 18th of November, Mr. Steve Krashinsky spoke to us on “The Boat People”. On the following Sunday, Mr. James Hayward gave an address on “A Ministry to the Prisoner”. This is a development ministry to those in prison as well as those who have been recently released. Coffee hours after both services provided an opportunity to meet and talk with these visitors. Our choir and the choirs of Glebe Presbyterian, Manor Road United, and Bethel Baptist Churches joined together for a Sunday Choral Evening held at the Transfiguration. The children’s Christmas Party and luncheon was a happy event that all enjoyed. The choir prepared well for the Carol Candlelight Service and performed splendidly. The celebration of Holy Communion on Christmas Eve and again on Christmas Day enabled each one present to rejoice in the Christian faith. In early February of the new year, the Boat People Committee, having decided to adopt a family from Indo-China, submitted an application to the Immigration Department. It was expected the family would arrive in April or May. The Committee had been set up as an independent group and relied on independent contributions. Felicia Sutherland, Felicity and Judith Harrison, Jenny Ferns, and Irene Saul worked closely with Malcolm Sutherland in preparing and gathering the necessities to help establish the adopted family. By April almost $6,000 of the $8,000 required to support a family for one year had been donated. In late April the Nguyen family arrived in Toronto. They stayed at the house of Jenny and Pat Ferns for several days until they moved into their own apartment in the Yonge St. and Manor Rd. area. During the spring, generous contributions of clothing, furniture, kitchenware and other items were received. A combined fundraising BBQ and welcome party was held on the church grounds after the morning service on Sunday, June 8th. Frances Hogg, a member of the Parish, who is associated with the Manor Rd. Nursery School, extended an invitation to the congregation to attend an Open House on April 22nd. Visitors viewed the creative work now being done by the teachers and parents of the School. The association of the school with the Transfiguration dates from 1939. In May, The Rev. John Brownhill became a priest in the Ordination Service at St. James Cathedral. In early June the choir members refinished the floor in the upper choir room. Once again this room is bright and attractive. Towards the end of the month new carpet was laid in the church. The main kitchen was completely renovated and given a fresh coat of paint. A new coat of tar was received by the parking lot. Several trees that had been encroaching on the church foundation were removed. The flowers planted by the sidesmen added to the beauty of the grounds. All these things enhanced the fabric of the church and maintained the attractive appearance. In the autumn the Advisory Council unanimously approved that memorial windows could be installed in the chapel. This will add to the beauty of the chapel and be an aid to worship. Interest had already been shown for the installation of two full windows. By the spring of 1981 donors had spoken for five and a half of the six full panes. The contributor group has agreed upon the theme “Great Women of Faith”. Mr. Josef Aigner of Toronto is the artist. The same Advisory Council meeting voted in favour of holding the service of Holy Communion at 11 a.m. on the third Sunday of months having five Sundays. All our members fully support this new scheduled. The Sunday School continues under the inspired teaching of Mr. W. Leach. In addition to the many services and events of the Christmas Season, 1980 saw the rebirth of a Church School Pageant. Mr. K. Loach was the able director. The choir and other people in the congregation also aided in the presentation. Plans were now under way to celebrate our Diamond Jubilee Year in 1981. Under the guidance of the Steering Committee, many parish groups and several individuals have worked for a successful celebration of this milestone. The most recent adornment to our church building is an oil painting that has been affixed to the Chancel ceiling. The subject is “The Holy Spirit Emerging From the Triune God”. Mrs. Gladys Whitehouse commissioned this painting by Mark Lemon. The colouring beautifully compliments the stained glass windows and lends an ethereal sense to the whole of the choir and sanctuary. It is expected Archbishop Garnsworthy will dedicate this new painting when he visits the parish in November for the climax of the Jubilee celebrations. During the past decade, many people have visited the parish in their search for a church home. Canon Lemon has always emphasized extending them a hearty welcome. New groups have been formed and social activities organized to meet their needs. The Transfiguration has gained new vitality from these newcomers. The new paintings have added beauty to our church building. The Processional Cross has added meaning to our worship. The additional service of Holy Communion affords more opportunity for spiritual fulfillment. In closing I would like to pay tribute to the Rev. Canon Lemon and the Rev. Dr. Harrison for the dignity and reverence they bring to the worship service.